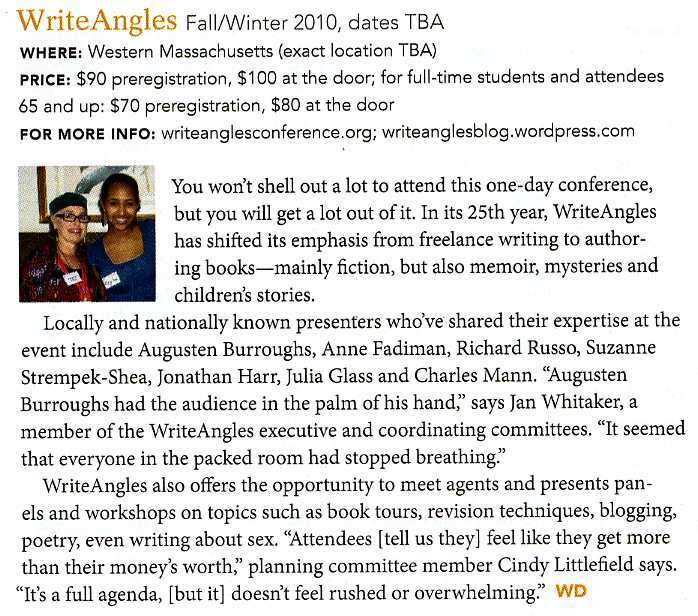 Writer’s Digest included WriteAngles among its pick of 2010 conferences that assist writers “to fill up on info without emptying your wallet.” (Obviously this article was in press before we had confirmed our reservation for October 23 with the Willits-Hallowell Center at Mount Holyoke College.) Equally important as our bargain rates, we present a day full of talks, panel discussions, and meetings with writers and agents who are both wise and inspiring. Plenty of good food in a pleasant environment too!